If God goes wherever Chrit goes, then Christ brings God's fellowship to people who are humiliated, persecuted, assailed and murdered just as he was himself. 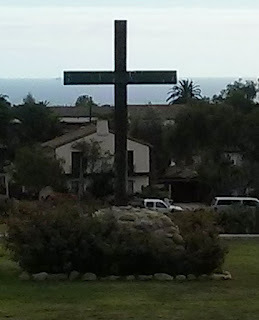 His cross stands between the unnumbered crosses which line the paths of the perpetrators of violence on this earth, in the Roman Empire from Spartacus to Jerusalem, from the death camps of the German Third Reich to the "disappeared" under the military dictatorships in Latin America. But God in Christ not only walks with us in our sufferings, as a companion on the way, participating in our suffering, through his own suffering, but there is hope for the future. I think that the reason why I keep coming back to the centrality of the resurrection is that without it there is only death, there is no future. I remember watching Mel Gibson's Passion of the Christ, and after all the brutality that filled the movie, the moment of resurrection was passed over so quickly that it didn't seem to matter. I sat their wallowing in suffering, with no hope for the future. Moltmann, who acknowledges the reality that God in Christ has experienced our suffering and has walked with us in our suffering, does not let suffering have the last word. There is hope for the future, a hope that sees the fragmentation of this world healed and made whole. It is that hope of the future wholeness that should empower and inspire us to engage in the work of reconciliation and healing now, as the Spirit of God is present in our midst and in our lives. Isn't the point of faith - the point of the life and message lived by Jesus - that the Good News life is worth living regardless of the suffering? Is it really faith if it requires a miracle to validate it? How well are we living the Good News if we are not invoking retribution? For all its non-violence and lack of vengeance, the Good News life is also defiant and dangerous. Our Good News life should involve a strong element of defiance and danger because we refuse to live in accordance with the social practicalities of the world. We will be generous and hospitable to everyone and we will seek justice for everyone and we will not do so quietly or invisibly. We live this way because it is the right way to live. The Good News is life - here and now - in the kingdom of God. It does not require a sacrificial death or the miracle of a resurrection to "prove" the rightness or correctness or holiness of the Good News message and life. It only requires that we live it.